So did you give them the "bird"
So you're going to be at the Creep and crawl? I might have that event at my cabin.Creep around and then crawl back to your bed. 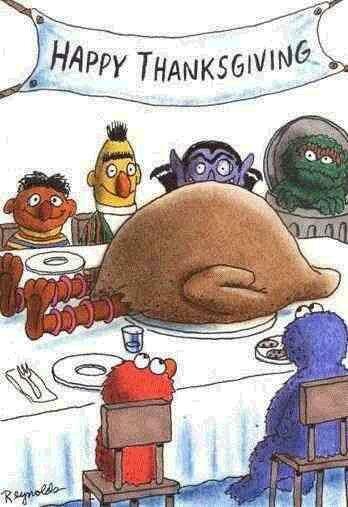 Happy Thanksgiving everyone. Hope you all have a wonderful weekend with your families!!!! My wife doesnt cache and she is recovering from knee replacement surgery from two weeks ago, so I have been playing Mr. Mom...and it looks like it will continue this weekend, I am looking forward to a break at CP4... my in-laws don't "get" the geocaching thing, they tolerate it though, sheeesh! Put xmas lights up. Car 70% packed for CP4. Had dinner. watching football and . Happy Thanksgiving! going to the movies with my wife today, the first time in a year! Seeing New Moon, yes, I am a twi-hard fan, it's true! Still misbehaving while in Sarasota, only found 1 cache today. Need to check on 3 of my caches 1 log is full and 2 have water damage.They are old ones so they will have to wait a week or 2 until I get a day off. Great, the more the merrier! Plus I can sneak off to cache and while you guys fill in for whatever task I get assigned! SAY WHAT?!?! you should be filling in for me!! and only the weak will and stay up and with the rest of the CREW!! !